HomeCelebs'Zero' teaser: We couldn't have received a better Eid gift! 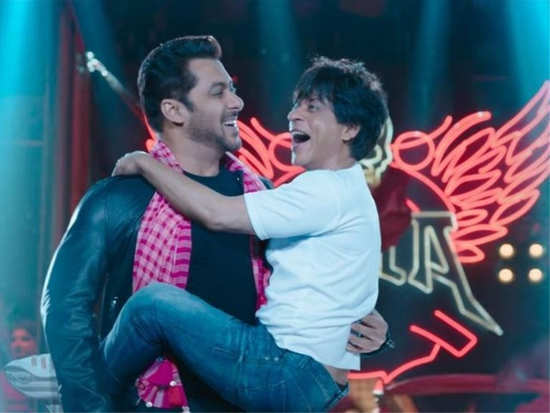 The 'Zero' teaser seems to be a special gift from Shah Rukh Khan and Salman Khan on Eid! Shah Rukh Khan’s experiment with roles continues. King Khan’s upcoming film, ‘Zero’ has him playing the role of a vertically challenged man, a dwarf to be precise. The teaser of this Aanand L Rai directorial dropped in an unexpected manner today and trust us, we couldn’t have received a better Eid gift. The film that stars Shah Rukh in the lead role also stars Anushka Sharma and Katrina Kaif and has a horde of stars making special appearances including the likes of late actress, Sridevi, Rani Mukerji, Kajol and many more. The much-anticipated teaser begins with a voice-over from Javed Jaffery at a dance competition. A nervous, dwarf, Shah Rukh approaches the stage, followed by Salman Khan in what we assume will be a guest appearance! Salman makes him feel comfortable and the two dance together as the crowd around him breaks into an applause. ‘Zero’ is slated to release on the 21st of December. 1'Zero' teaser: We couldn't have received a better Eid gift! 2Kylie Jenner deletes all photos of her baby girl, Stormi Webster on Instagram! 3Nick Jonas brings Priyanka Chopra as his date to cousin's wedding!